Thunderstorms and heavy rains dumped several more incheas of water into the Missouri River in Nebraska, Iowa, Missouri and Kansas communities early Monday. 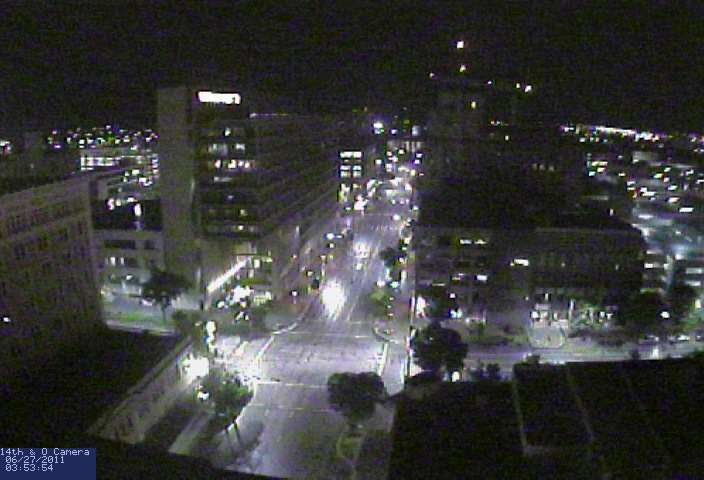 It’s shortly after 3:00 a.m. Monday. 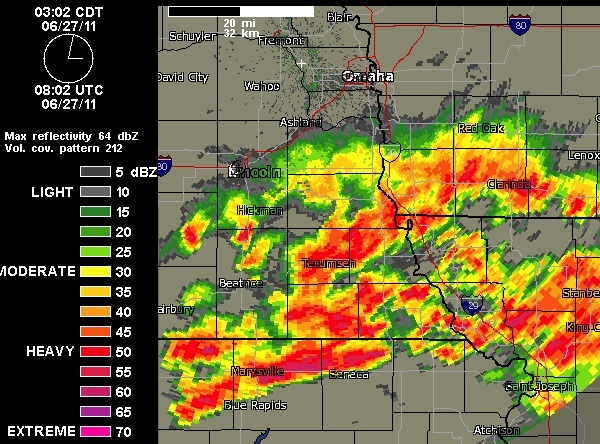 The rain is still skidding off my roof in Lincoln, Neb., after the second deluge of this night. I’m worried for areas east of us along the Missouri River where flooding is already at record stage in many places. These heavy rains could quickly add several more inches to the swollen river which has already topped levees and flooded thousands of residents out of their homes in the four state region. When a second line of thunderstorms rolled through around 1:30 this morning my wife and I were awakened by a huge clap of thunder. That was followed by a half hour of rain so heavy the neighborhood flash flooded, causing a steady leak from our basement corner window well. All this sent us scurrying for the wet vacuum and a mad round of furniture reshuffling to make sure all was dry. Oh well, at least we found the window screen we’ve been searching for over the past two years. It was hidden behind the furniture we hastily moved. Curious to see what more precisely was causing our leak, I slapped on my sandals, grabbed a flashlight and journeyed into the backyard. There I found a four foot wide miniature flash flood steam. Fortunately, the stream was running around and away from our house, but the neighbors backyard had been turned into an impromptu swimming pool, fed by the falling sheets of rain. Eventually, all this water gushed across the neighbor’s front yard, sliding into the street-side storm sewer, which rushes into the Platte River, which flows into the Missouri River 60 miles east of our house. The illustration below comes from the National Oceanic and Atmospheric Administration predicts the impact of the latest rains on the Missouri River as it passes by Rulo, Neb., in the coming days. As you can see, between now and this time tomorrow, another elevation foot of water will be added to the Missouri River as it crests at a predicted 27.12 feet, a new all time flood record and 10 feet above flood stage. What makes this flooding so dangerous on the Missouri River is that the river moves fast and it’s pushing historic volumes of water. 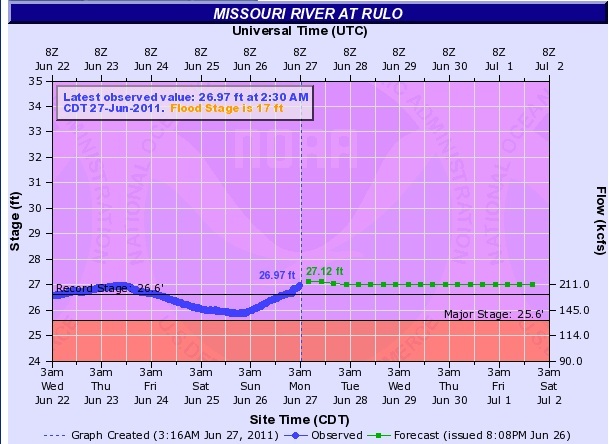 Through the end of this week the Missouri River is predicted to move more than 211,000 cubic feet of water a second past Rulo. 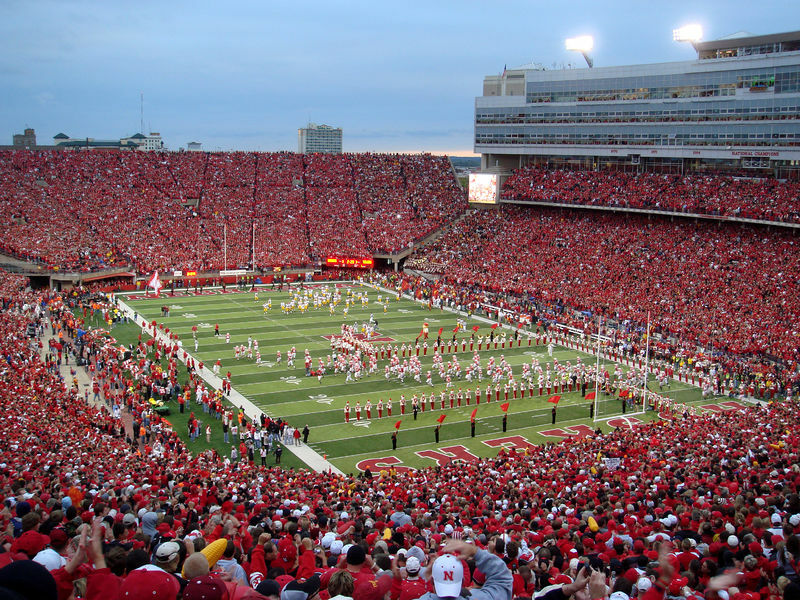 Try visualizing it this way: That’s more than 1.5-million gallons of water a second, or enough to fill our beloved Memorial Stadium at the University of Nebraska-Lincoln from top to bottom in about 63 seconds. This entry was posted in broadcasting, education, Environment, nebraska, The United States, University of Nebraska and tagged flooding, levees, Lincoln Nebraska, Missouri River, rain. Bookmark the permalink. I can’t imagine that amount of water flowing past you. I pray that you all will be ok and that this tragedy ends for everyone along the Missouri river.